Welcome to The BURG Peer Education Network Website! To learn more about what we do, visit the About Us pages listed in the menu bar! We would like to announce that we are taking applications for our FYI 2018. FYI is the First Year Initative, where students come to campus a week early and gain much needed skills such as leadership, communcaiton, team work, and how to become an emerging leader on campus. It's an experience like no other, and creates a bond that we like to call family. Other than that, you will also become familar with the Frostburg campus and locations in the nearby area. FSU Students, welcome back to the first week of school! We invite all of our BURG members & students on the campus out to eat breakfast/lunch/dinner with us. 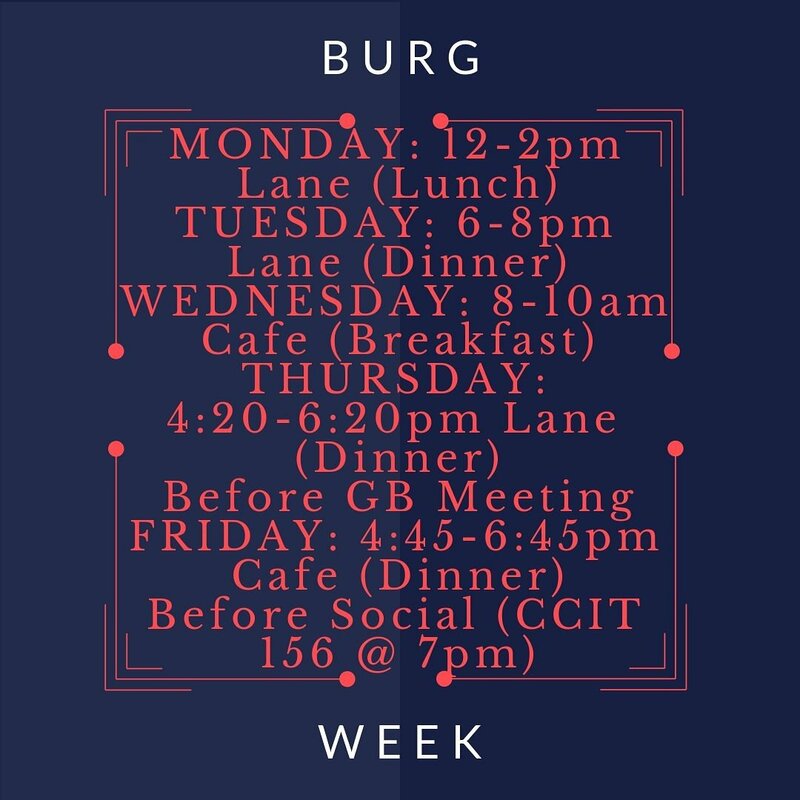 BURG Week will be jam packed with these events to help us to get to know everyone, all leading up to an incredible social. See you then! Come over to Frostburg's Main Street on Wednesday, September 7th from 5:00 PM to 10:00 PM to enjoy the annual Block Party! Local businesses and FSU student organizations will be filling the street with tables and activities, and the BURG Peer Education Network will be there with FREE incentives and more! Come out to learn more about Frostburg and what it has to offer to you! Order your BURG Bash 20 commemorative t-shirt today! It's that time of the year again! In a few short weeks, BURG will be hosting it's second annual Reunion! Please check out the link below for all of the details! Hey Everyone, Check out this awesome resource for ways to stay fit in college! Susan Martin is an extremely talented graphic artist! Click Here To Apply Today!!! We had an amazing time at the Metropolitan AME Church in Cumberland, MD this afternoon! These kids showed us just as much as we showed them! They are ALL about B'ing the 1 now! The BURG Peer Education Network had an awesome time at the Color Splash down in the Lower Quad today! It was so nice to see all of those smiling faces! Bthe1! Congratulations to the new 2013-14 Lead Team!